According to local news, Georgia is suffering the third worst winter in recorded history. It is not nearly as bad as we have weathered in our lives especially in Maine and North Dakota. I am savoring it for the times the heat and humidity sap the will and strength. Today the rain was so steady, Maggie insisted on us returning home before we walked by our neighbor’s lot, very unusual for her. We tried two other times during the day but she was not having it today and each time we returned we dried her soaking wet self off. It was a great day for knitting. I have sewn, knitted, or cross-stitched at least five minutes since I last wrote. My completions are complicated by the fact that a lot of my supplies and equipment ar e still in storage due to a water emergency after I returned from the National American Sewing Guild Conference in Washington DC. 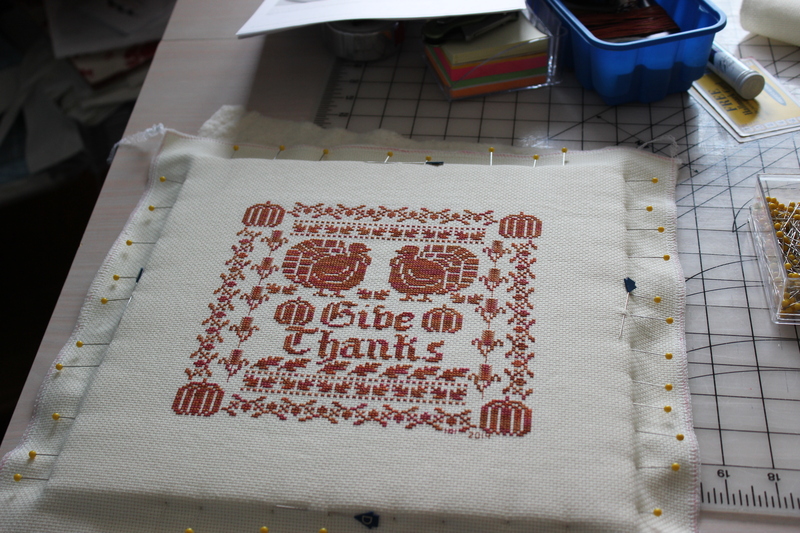 I have started the process of framing the cross-stitch. I am lacing it, I had to buy a needle to do the lacing so it is set up waiting for the lacing to be completed. I wanted to finish this blog first. 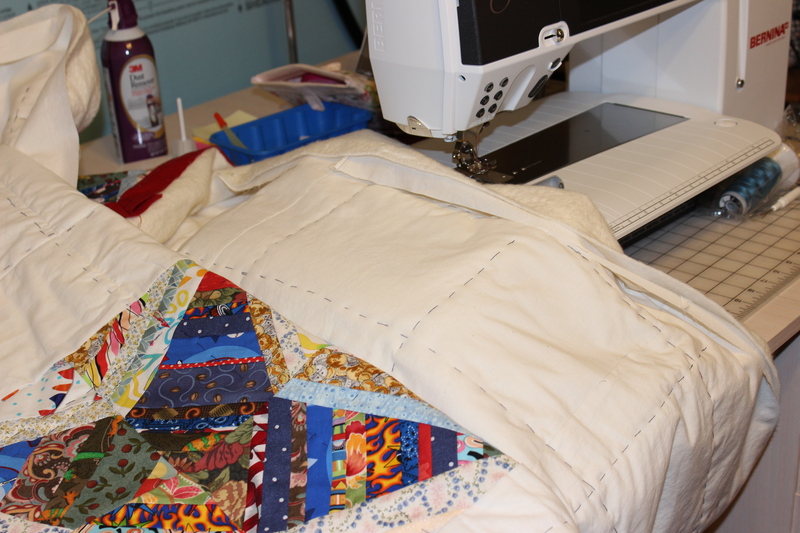 The other thing I was able to make slow progress on is quilting the quilt for our veteran. I was able to find everything except an echo quilt foot to proceed and I started the stitch in the ditch from the center tonight. This has made me feel great that I am moving forward on this one and will fill total relief when we complete it. I want to turn out great, it is only the second quilt I have quilted, the first is the one in the header of this blog. I have a lot to learn to become any good. This past weekend our Macon Chapter of the American Sewing Guild sewed up snugglies for the NICU at the local hospital, I believe we made 37 all together. I am working at making a pattern that we can post to make these so they will be easier to make for the next time. I think it is a great project that helps these tiny babies develop strength by bouncing their limbs against the sides mimicking the way their limbs bounce against the mom’s womb. It was interesting listening to how they are used by the nursery and why. I will be putting this on my list to make more of after I finish a few other projects ahead of it. There is a pile waiting that keeps yelling at me every time I visit the bonus room. I will explain that project as I get to it, more later. As I find supplies and gather them in one place in organizing our home, I find stashes of yarn and found enough to make an afghan, this will be a prayer afghan for a family member ill with stage-4 lymes disease. This is rows of cables on size 13 needles. 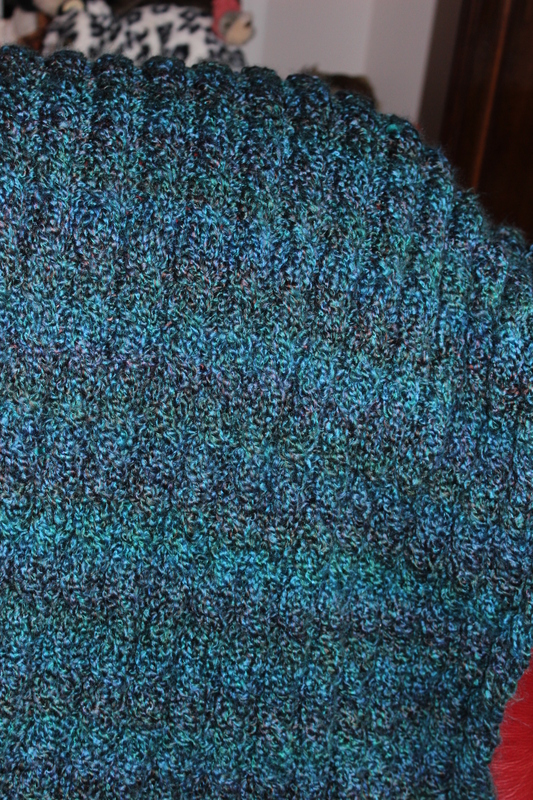 The color is called lagoon by Lion Brand Yarn in Homespun. I have finished 3/4s of it in the last week or so and hope to have it complete by next week to send off. I am hoping to take a lace knitting class in Macon at Creative Knitting and am looking forward to increasing my knitting repertoire. Until next time, Sew on! Aside | This entry was posted in Knitting, Sewing and tagged ASG Community Service, knitting, National American Sewing Guild Conference, Quilt of Valor, Sewing. Bookmark the permalink.